I am happy to be able to share some exciting science publishing news with you. As you know, in the past few years, there has been a tremendous progress in open access publishing. 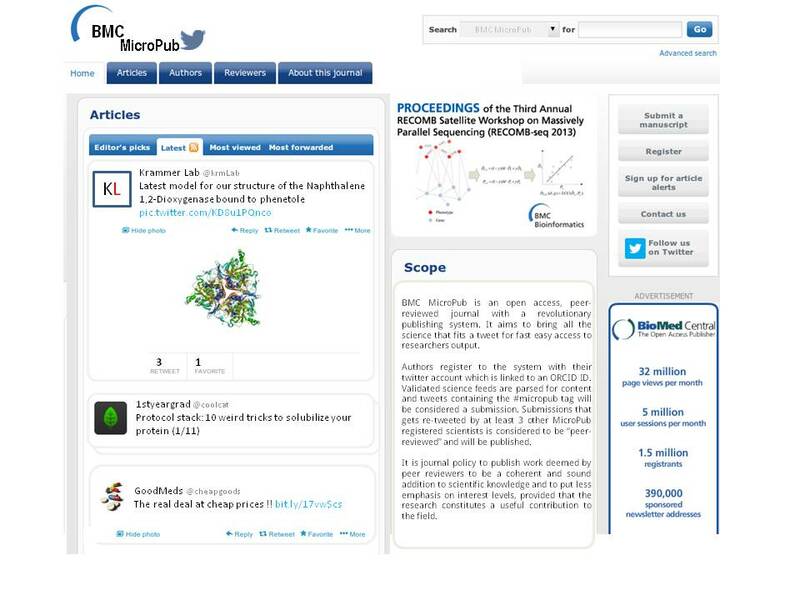 The author-paying model has been shown to be viable in large part thanks to the pioneering efforts of BMC and PLOS. In particular PLOS One has been an incredible scientific and business success story that many others are trying to copy. Although these efforts are a great step forward they don't do enough to set all of the scientific knowledge free in a timely fashion. Sure you can publish almost anything today such as metadata, datasets, negative results and the occasional scientific advancement but the publishing process still takes too much time. In addition we are forced to build a story around the bits and pieces in some laborious effort to communicate our findings in a coherent fashion. Many of us feel that this publishing format is outdated and does not fit our modern quick-paced internet age. What I am sharing with you today is going to change that. In coordination with BMC we are going to launch soon the pilot phase of a new online-only publishing platform. It was though from the ground up to allow for the immediate publishing of granular scientific information. Peer-review happens after online publication of the content and evaluation is not going to be based on trivial and outdated notions of scientific impact. Best of all, it is tightly integrated with the social tools we already use today. 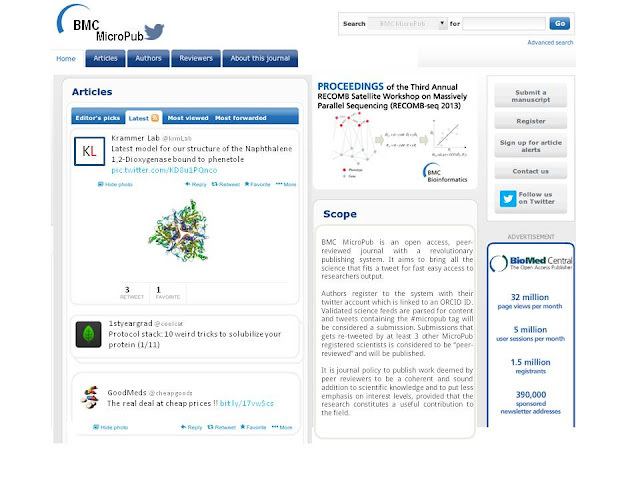 In fact, authors are asked to register to the system with their twitter account and to link it to an ORCID author ID. From then on, their twitter feed is parsed and any tweet containing the #micropub tag will be considered a submission. Authors are themselves reviewers and any submission that gets re-tweeted by at least 3 other MicroPub registered scientists is considered to be “peer-reviewed” and a DOI is issued for that content. An author can create a longer communication by replying to a previous #micropub tweet and in this way create a chain that the journal can track and group in MicroPub stacks (TM). What the team involved here has done is nothing short of amazing. We are taking the same platform we use to share cute pictures of cats and revolutionizing scientific publishing. To start using the journal authors pay a one time registration fee followed by a modest publication charge for each published content. However, the journals is waving any charges for the first 100 authors and the first 100 publications. We hit a snag in discussions with Pubmed but with your support we will be tracked by them starting next year. I sat down with the open access advocate Dr Mark Izen from UC Merced to discuss the new journal. Dear Mark, given your enthusiasm for open access what do you think of this initiative? I think that experimentation in scientific publishing is fantastic. Any attempt to promote open access and get rid of the current established closed access, impact factor driven system is a great thing. One concern I have is that, although the content is published under a CC0 license, the publishing process is currently reliant on Twitter which is a closed proprietary technology. We should really ask ourselves if this goes all the way in terms of open science. Some would say that they don't have time to read science with this level of granularity so devoid of any significant advances. In the words of an anonymous tenured prof: “You must be joking right!?”. What would you say to these naysayers? To be blunt, I think they lack vision. Ultimately we owe it to all tax payers to be as transparent as possible about our publicly funded science. Now we can do that, 140 characters at a time. Moreover, the possibility to drive science forward by making information available as quickly as possible is an amazing possibility. Scientists are already using twitter to share information, we are just going one step forward here and going to start sharing science as it happens. You could get corrections on your protocol before your experiments have finished running ! If you blink your eyes you may literally lose the next big discovery. So you are not concerned that this increasing level of granularity, small bite research, is going to drown everyone in noise and actually slow down the spread of information in science ? Absolutely not. It is a filter failure and we are sure that someone is bound to come up with a solution. In the future all sorts of different signals will allow us to filter through all this content and weed out the most interesting parts for you. You will be able to get to your computer and get in your email or in some website just the information that an algorithm thinks you should read. I am sure it is doable, it is question of setting it up. Disclaimer: If you have not noticed by now, this is a fictional post meant to entertain.